The summer I was 12 was not so great for me; for the first time in my life, I was feeling that dark anxiety that would become familiar to me over the years. This is why I was riding my bike so furiously, so carelessly. This is why I didn’t look before darting out in front of a city bus. I saw a flash of red and white, and felt lifted into the air, out of my body. I felt the choice, Stay or Go? “Stay,” I whispered. I saw a sparrow flying into the sun, then felt a heaviness as I returned to my body and watched the ground rush up to meet me. The bike I was riding had been dragged under the bus to become a twisted piece of metal. Somehow, I had been thrown completely clear – over ten feet in front of the bus. I was unhurt, but my spirit had been rattled out of my body, and I was finding it difficult to focus, so the paramedics took me to the hospital. For days after the accident, my mother worried. I was a different kid. I was quiet. I sat on the porch for hours and stared apparently at nothing. My voice sounded different and I barely used it. That night, I had left my body again and gone to the Pink Garden in heaven. I don’t know much about the pink garden just yet – I’ll have to ask about it tonight. I remember that everything was shades of pink, and that I felt so happy, settled and healed. This is why I was so quiet in the days following the accident – I wasn’t in shock, I was basking in the warmth of heaven’s love. Eventually I came back to myself. It occurred to me this morning that this is when I started to notice a difference in my memory. I don’t have a great memory. Oh, I remember experiences just fine. I remember concepts. But I don’t remember names, places, song titles, or even conversations. This started in the sixth grade for me following the accident – I noticed that learning was no longer as effortless as it had been. I discovered memorization – this is how I was able to maintain high grades through the rest of my school career. I could memorize lines for a play, formulas for math, names and dates for history. I would take the test and then the memory would evapourate. I learned to use my understanding of our testing processes and my ability to temporarily memorize almost anything to my advantage, but it was hard work. I made top grades in high school and college, yet I remember nothing, almost nothing of what I learned. I remember concepts, but not the names of the scientists who first “discovered” them, and claimed them. 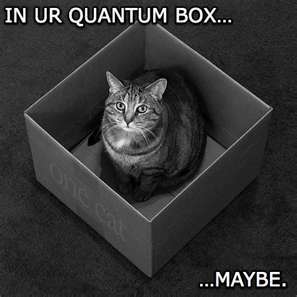 Ok, I remember Schrodinger, but only because of all the lolcat memes. Anyway, this memory thing perplexes Sweetie at times, because we’ll have a conversation and a few days later I’ll bring up the topic again as though we’d never discussed it. I’m grateful for her reminders, grateful I don’t have to remember things on my own. Since I’ve opened up completely to being psychic, I’m even more of a space cadet, but I’m starting to understand why: I get so much, great volumes of information when I do readings. I simply let it flow into my body, through my brain, out my mouth in words. Then it’s gone. There is no need for me to hold on to this knowledge – this stuff that was not meant for me. This means that clients will tell me something and expect a big reaction, like, “I fed Taz spaghetti last night!” But I will have forgotten that Taz requested spaghetti at his Mom’s last reading, so she’ll get a blank stare from me. I suppose the memory thing is part of being psychic for me. If my psychic great grandmother was available, I’d ask her if she had the same thing… but she’s incarnated at the moment. I’ll have to ask someone else. It’s funny that it kicked in after I was hit by the bus, after I decided that I was tough enough to survive my teenage years. Wow that sounds dramatic… but at the time, I sure felt like I barely got out of there with my life. I said “Stay,” and I think that opened something in my brain. I was a psychic kid, and had worked pretty hard to shut away the ghosts who moved things in my room and smiled at me in the mirror. My visit to heaven was the first time I think I really experienced the good side of the paranormal world.